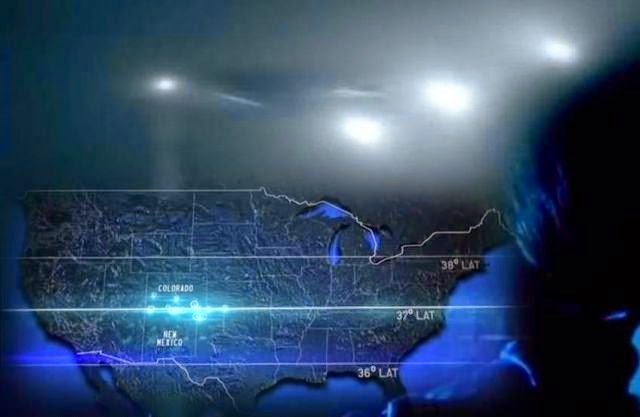 A brother and sister alien hunting team have discovered a “UFO highway” across America along which hundreds of unexplained events have taken place – from cattle mutilations to alien abductions. He called his sister – who noticed the same with her investigations in Missouri – and the pair began researching the phenomenon, discovering that there are clusters of unexplained events taking place across the same latitude line. Their theory is now the subject of a book called The 37th Parallel – and is about to be made into a Hollywood blockbuster in the next few months. “And she said, ‘Yes’ and we started looking more into it. We soon realized it wasn’t just cattle mutilations – there were all kind of events. Examples of cases along the line include the Joplin Spook Lights – unexplained balls of light that have been appearing in Hornet, Missouri since the 19th century; The Aztec, New Mexico incident of 1948 when a flying saucer allegedly crashed; and Piedmont, Missouri where 500 people reported UFO sightings in 1973. The infamous Area 51 in Nevada – and the Dulce Base – an alleged underground alien base – are also located on the line. A map of the “UFO highway” across America. “For the next month or so I start looking at all these cases and I had all this data,” Chuck explained. “All these GPS co-ordinates, everything from Native American sites to underwater caves. “I released it all on my website and I mentioned it during an appearance on the Science Channel’s Unexplained Files – then for the next season of that show they asked me to expand on the theory so I did a whole episode on it for them. “The bottom line is the 37th latitude is like a UFO highway or paranormal highway across the continent. After his appearance on the Science Channel a Hollywood producer got in touch and told Chuck his theory would be a great idea for a book and movie. The book The 37th Parallel, by New York Times best selling author Ben Niezrich, came out last year – and a screen play is currently being written. “In 2015 I signed a life-rights contract with Flint Pictures – it got picked up by New Line Cinema – Warner Brothers before the book was even written – just on the idea,” Chuck said. “The book came out last year. The screen play is being written by a Hollywood screenwriter who has written movies for Matt Damon, Robert De Niro, Robert Downey Jr and should be ready in the next month. Debbie said she is now investigating what incidents have occurred on the 37th latitude around the world – particularly over water. Athens, Greece, sits on the line – and it’s also the the dividing line between North and South Korea. Debbie has even witnessed UFOs herself on the 37th latitude after a party at her family’s lake house near Farmington, Missouri – which lies on the line – last year. “I have an app on my phone that you can use to look up and it tells you what planets and constellations are visible,” she said. “And then all of a sudden we saw four stars in a formation. They were small stars which kept getting brighter and brighter – so apparently whatever it was was coming into the atmosphere then the one on the top left hand corner shot fast, straight up, and the top right and bottom left did the same – and the bottom right one went right across the horizon. Chuck and Debbie say they have investigated hundreds and hundreds of paranormal cases – and it’s not just UFOs – the pair also investigate ghost and Bigfoot sightings. “I get three or four people a week getting in touch with me through my website – sightings, photos and videos – I always have a backlog,” Chuck said. “We started off as crash retrieval investigators but then you gather all this equipment like geiger counters, Electro Magnetic Fields (EMF) instruments, night vision goggles and then people get in touch. “Lots of Bigfoot sightings are associated with UFO sightings – and ghost investigations started coming up because I had all this equipment. “We use EMF instruments to look for trace evidence to look for crafts or entities because they leave electronic signatures – well it turns out ghosts leave electronic signatures too. “Sometimes where they have had ghost sightings the orbs they see might not be ghosts but UFOs.